You’ve seen this title a thousand times, and the “solutions” seem to be frustratingly similar…”wash your skin twice a day” or “always moisturize!” And at some point, you are staring at your face in the mirror, and you ask yourself why you should have to wash your face twice a day with a specialized cleanser, when your BFF sleeps in her makeup every night, only to wake with flawless skin. It happened too often to me, and I started to question these classic skin rules. Furthermore, they never actually helped. Several times they just made my skin worse! But eventually I did have clear skin, and I certainly didn’t get it using a “4 Step Skin System.” This isn’t to say that some ladies don’t have lovely skin using a lot of products, or that my skin is absolutely Photoshop perfect. But within a few months, my skin changed dramatically, for the better. 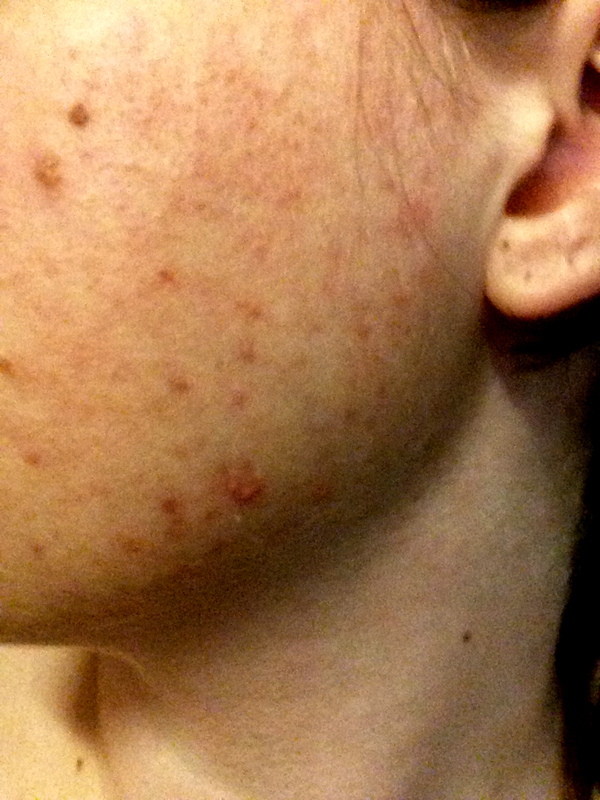 If you think your acne is similar to mine, these tips might just clear it up! My skin in 2013..only three of the spots are freckles. To start, let’s describe my skin in the past. I started getting acne in 7th grade. By my junior year in high school, it was a mess. Mostly I had a sea of papules and whiteheads. My nose was the only place I didn’t have those, but rather blackheads. Taking various forms of birth control cleared my skin up completely. This was obviously hormonal, but I didn’t think to focus on what was inside. I went to a dermatologist, who gave me a harsh cream (didn’t work). Something about using the cream seemed pointless. Other skin care systems (quite expensive at the time) made my skin even more irritated. At 23, my skin was at its worst. I had inflamed pustules on my jawline, chin, and cheeks. I was fed up with taking medication just to look normal, and I never saw the point in drying creams. I wanted something simple, natural, and effective. I didn’t want to go to another dermatologist or doctor, just to hear the same mess. My skin didn’t fully clear until I was 24 years old. There was one huge…HUGE reason why it cleared. However, all the other tips are just as important. If I see any acne, I know exactly why. On to the tips! If you touch it, you will regret it. My skin always gets more irritated if I poke, scrape, pull, pop…you get the picture. This rule includes tweezers, just don’t do it! If you must, please sanitize your tools, or have a professional take care of this. We want to be gentle with our skin and let it heal. Stop complaining. Yes, I said it. Stop looking in the mirror and feeling sorry and depressed the whole night. Look at your eyes, aren’t they a nice color? Think about what you do like, and put a smile on your face! And yes this seems so harsh, but thinking about your skin for 18 hours a day is not healthy for your mind. You have a million good qualities, and you need to recognize them in yourself. Confiding in a close friend is okay, but refrain from making most of your conversations about your acne. Even researching too much can mess with your head. Find a good hobby to distract you. These are big factors, and too many people brush them off. Buy a jug like this, and drink it every day. Only put water in it! If you want to have a smoothie in the morning, great. Eat a diet that works for you. I’m not about to jump on that pony. You can try an elimination diet to figure out what works best. Do exercise that you enjoy so that you will stick with it: weightlifting, jogging, hula-hooping, tennis, etc. Get 7-8 hours of sleep each night. This one is rather loaded, and can even sound extreme, but this is what I did. You can adjust it for your lifestyle. Stop wearing makeup, and be very selective about your skin products. What does that facial lotion really have in it? Did you read the label? Are you positive that it is not irritating your skin? When your skin product has 20 ingredients, it can be really hard to say which are contributing to irritation, and which are doing your skin good. Take a look here and pare down your products. If you are like me, ditch all the facial products you own and only use Aloe Vera, Almond Oil, and Castor Oil. Aloe Vera is truly amazing. If I see any irritation or pimple, I layer this stuff on thick. By the next day, my skin looks great! This is the most important tip that I can offer. It honestly makes a huge difference for my skin. Reducing stress means taking care of your mind and your body. This can be something big, like following a dream that has been tearing you up inside. It can be small like nightly meditation or talking to a good friend! Now make a list of everything you need to do to improve your life. I recommend Wunderlist or even a nice journal. I sincerely hope this has helped. Cheers!